As a symbol, Shiva Nataraja is a brilliant invention. It combines in a single image Shiva's roles as creator, preserver, and destroyer of the universe and conveys the Indian conception of the never-ending cycle of time. Although it appeared in sculpture as early as the fifth century, its present, world-famous form evolved under the rule of the Cholas. Shiva's dance is set within a flaming halo. The god holds in his upper right hand the damaru (hand drum that made the first sounds of creation). His upper left hand holds agni (the fire that will destroy the universe). With his lower right hand, he makes abhayamudra (the gesture that allays fear). The dwarflike figure being trampled by his right foot represents apasmara purusha (illusion, which leads mankind astray). Shiva's front left hand, pointing to his raised left foot, signifies refuge for the troubled soul. The energy of his dance makes his hair fly to the sides. The symbols imply that, through belief in Shiva, his devotees can achieve salvation. New York. Asia Society. "The Cosmic Dancer: Shiva Nataraja," March 9, 1992–June 28, 1992. Honolulu Academy of Arts. "The Cosmic Dancer: Shiva Nataraja," September 16, 1992–October 25, 1992. New Haven. Yale University Art Gallery. 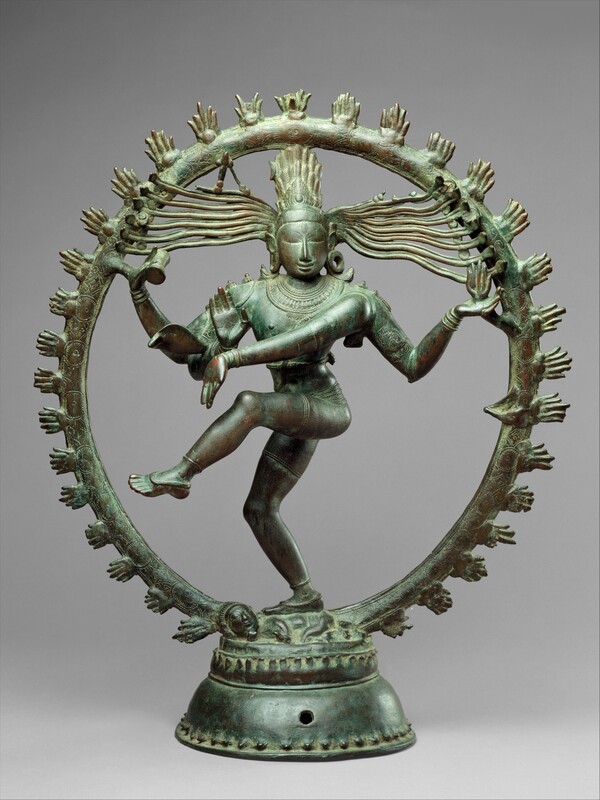 "The Cosmic Dancer: Shiva Nataraja," February 7, 1993–April 11, 1993. South Asia: South, 1000-1400 A.D.